PREMIUM QUALITY: 16 layers multi coated optical filter, 99% transmittance of our MC UV filter compares to 90% transmittance of normal UV filter. Protect your expensive lens from dust and scratch while not lowing your photo quality. ULTRAVIOLET PROTECTION: Multi-coated glass blocks and prevents the harmful effect of UV rays and eliminates haze that can register a bluish cast from scenic shots. ULTRA SLIM: only 3mm in depth, slim profile design ideal for wide angle lenses. 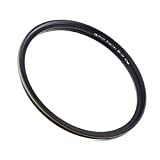 A golden line on circle adds beauty to the filter and your DSLR camera. GREATEST COST PERFORMANCE: Why buy those cheap, none coated, resin UV filters? A MUST HAVE: Most popular protection filter for general and everyday use. Backed with waka’s 90 days 100% Satisfaction Guarantee. NEED OTHER SIZES? CHECK PRODUCT DESCRIPTION BELOW! UV filters are one of the most popular protection accessories for lenses. Nowadays most people use it everyday with their DSLR cameras to protect the lens from dust and scratch. Besides that, UV filters block and prevent the harmful effect of UV rays and eliminates haze that can register a bluish cast from scenic shots. – Multi-coated UV filter works better than none coated filters. Having 16 layers multi coated on glass, the transmittance of our filter is up to 99% compares to only 90% of normal UV filter. You’ll have the UV filter mounted all the day, and you won’t want the low quality none coated UV filter damage your photo quality. – Ultra slim design. Our MC UV filters is lightweight and ultra slim, makes it ideal for wide angle lenses. – A golden thin line on outside of the filter circle adds beauty to the filter and your DSLR camera. – Great Cost Performance. We’re here to deliver a high quality yet affordable MC UV filter to replace those cheap, non coated and resin UV filters on the market. This entry was posted in Discount Photography and tagged 67mm, Canon, Coated, DSLR, Filter, Layers, lens, Multi, Nikon, Protection, Slim, Sony, Ultra, Ultraviolet by Ball Photo. Bookmark the permalink.